New EU legislation which will put the onus on airports to help disabled passengers could lead to increased costs, airlines say. The proposals, to be set out on Wednesday, are the first European laws on disability rights. Assistance for disabled passengers will be provided by airports centrally rather than by individual airlines. But the Association of European Airlines (AEA) said this will put 30p on the price of every ticket. "Centralised systems will be able to charge whatever they want," said an AEA spokeswoman. The new rules will make it illegal to charge the person receiving the service. They will also ensure that assistance is provided from the moment a disabled passenger enters the terminal building. The AEA said several airlines provided "a very good service", and should be able to opt out of a centralised system. But European disability groups, and the airports themselves, think that giving exemption to some carriers would undermine the service altogether. "This proposal is long overdue," said Nora Bednarski, of the European Disability Forum. "There are many, many cases where disabled people are discriminated against and treated like second class air passengers. "Shifting the responsibility to airports will improve the consistency of services and make it more transparent because there will only be one service provider and one responsibility." 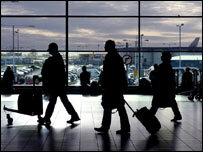 Airports Council International (ACI) said the proposed new regulations should be "an all or nothing deal". "For the central system to work it must apply across the board for all airlines," said Ronan Anderson, of ACI. Airlines believe that some carriers are paying the price for other operators who, in some cases, have failed to provide a proper service for disabled passengers. "We have worked so long to liberalise ground handling services so that they can offer efficient and cheap services and now we are rolling back the clock to re-establish a monopoly system," the AEA spokeswoman said. Disabled people often complain that the service they receive is inconsistent, sometimes inappropriate, and does not cover the entire journey. An enforcement body - controlled by airports and disability groups - is likely to monitor the service and set the level of charges. The legislation will now be considered by the European Parliament, and has to be adopted by the Council of Ministers before it comes into effect. British Labour Euro MP Richard Howitt who is President of the European Parliament¿s Disability Rights Group of MEP¿s, said not one airline should be allowed to opt out. "This would be a recipe for confusion, extra cost and ultimately an incentive for airlines to carry less, not more disabled passengers," he said. "The European Parliament should stand firm against the airlines and uphold rules, which will guarantee independence and dignity for disabled people."